(Wildenstein and Co., New York); Mr. [d. 1970] and Mrs. Lester Francis Avnet, Great Neck, Long Island, NY; purchased 19 October 1971 by NGA. A Comprehensive Exhibition of Drawings and Watercolors, Wildenstein & Co., New York, 1958, no. 14 (checklist). Old Master Drawings from the Collection of Mr. & Mrs. Lester Francis Avnet, circulated by the American Federation of Arts, New York, 1968, no. 4 (reproduced on the cover). NGA Recent Acquisitions 1974, no. 33. 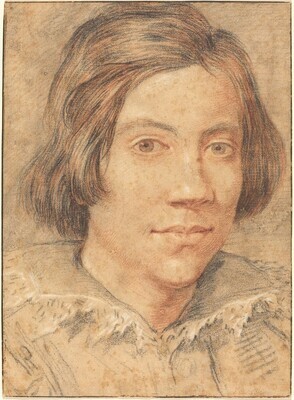 Old Master Drawings from American Collections, Los Angeles County Museum of Art, 1976, no. 118 (Ebria Feinblatt). NGA Master Drawings 1978, p. 70. Italian Portrait Drawings, 1400-1800, from North American Collections. Indiana University Art Museum, Bloomington, IN, and elsewhere, 1983-1984, 25 (Adelheid Gealt). "Reviews and Previews," Art News 57 (Summer 1958): 17. Fagiolo dell'Arco, Maurizio and Marcello. Bernini: una introduzione al gran teatro del barocco. Rome, 1967: 248c. Bennett, Mary Lee. Drawings from the Collection of David Daniels. Exh. cat., Fogg Art Museum, Cambridge, 1968: under no. 7. Zeri, Federico. "Gian Lorenzo Bernini: Un marmo dimenticato e un disegno." Paragone 9, no. 115 (1969): 63-64, pl. 42. Dessins français et italiens du XVIe et du XVIIe siècle dans les collections privées françaises. Exh. cat. Galerie Claude Aubry, Paris, 1971: under no. 13. Harris, Ann Sutherland, ed. Selected Drawings of Gian Lorenzo Bernini. New York, 1971: vii, xiv, no. 9. Martinelli, Valentino. Bernini disegni. Florence, 1981: VII. Walker, John. National Gallery of Art, Washington. Rev. ed. New York, 1984: 671, no. 1070, color repro.